Skintight Space Suits for Mars: What Kind of Suits Do Astronauts Need to Survive on the Red Planet? The space suit is torn between humanity’s two chief desires: exploration and protection. None more so than the one some of us will be wearing on Mars—which could determine astronauts’ survival while farther from Earth than humans have ever traveled before. But what people end up wearing on Mars is not just about being protected: What’s the point of going all the way to the red planet if we can’t act as humans do? We need to be able to bend down on one knee to collect a rock sample, or use our uniquely opposable thumbs to grip a tool and make a repair. Space suits are as important as thruster types and rocket fuels—and maybe more so—for the eventual success of a mission to Mars. After all, the suit’s capabilities and limitations will determine what kind of work we can do once we have gone to all the trouble of getting there, says Dr. Sheyna Gifford, who lived for 12 months in the Mars simulation HI-SEAS IV atop Hawaii’s Mauna Kea and has tested suits of various kinds. A good space suit is like a personal space ship: It must keep you alive but also help you live, says Gifford. It has to be practical: "Can you tie cords? Turn handles that open and close water lines? Does the suit keep you from tripping and prevent falls while still allowing you to carry water, mounted lights and cameras? It must have components that aren’t just robust but are replaceable, swappable and upgradeable," says Gifford. The challenges are pretty well agreed upon by space suit experts, but how to address them has brought two competing—and very different—types of suit design to the forefront. These new suits aren’t like the flight suits of yore, but understanding a bit about space suit history helps us understand how we got to where we are today and where suit design will take us. To deal with pilots passing out when G-forces pushed blood to their extremities, Japanese dive-bombers during World War II wrapped their bodies in tight elastic. That pressure on the body kept blood in the brain, which was critical during superfast maneuvers. Later, gas-pressurized suits were developed. Described as a “tire shaped like a man,” they kept internal pressure at a comfortable level for the person inside it. The first space suits, for the Mercury and Gemini missions, were modifications of these high-altitude pilot’s outfits. These work well—until the person inside that blob of air and rubber has to move. Each time he or she lifts an arm or takes a step, that life-saving pressure also pushes back. Think of walking around inside a body-shaped basketball—that’s the gas-pressurized suit. It’s not a big deal for a relatively stationary pilot, but it’s tougher on a more mobile astronaut. The extra work every time an astronaut moves a joint can be exhausting over time. When astronauts prepared for the moon landing in the 1960s, the gas-pressurized flight suit was a proven technology, so it was refined. But the basic ideas weren’t rethought; it was still all about a human in a pressurized suit with exterior protections. 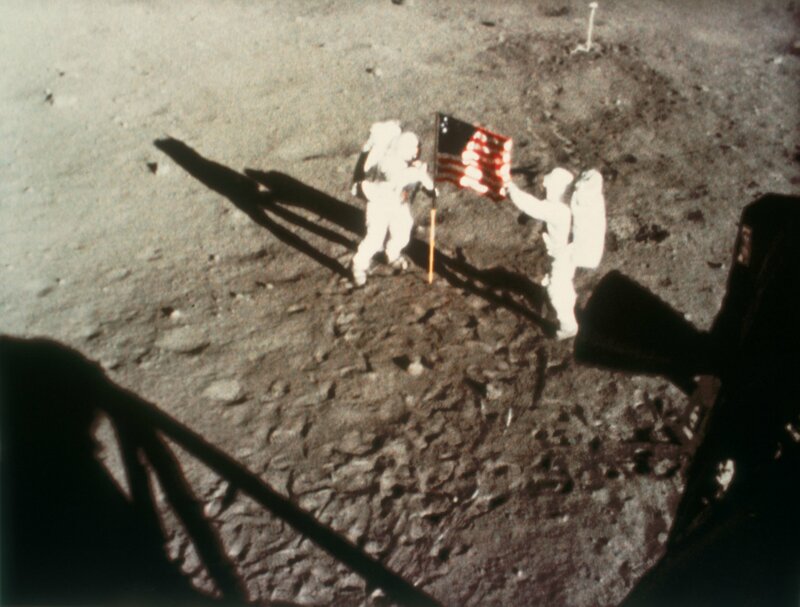 However, the moon suit needed to be tough for walking around the surface, not just floating in space. Hard suits, which were still pressurized within, were one solution. Reminiscent of medieval armor, these suits didn’t even touch the astronaut inside, save for the hands and feet, and were more comfortable for that reason. Those who tested them said it was more like being inside a suit, rather than wearing it as a piece of clothing. The hard suit and its several iterations really looked the part of the brawny American astronaut—think Buzz Lightyear from Toy Story . 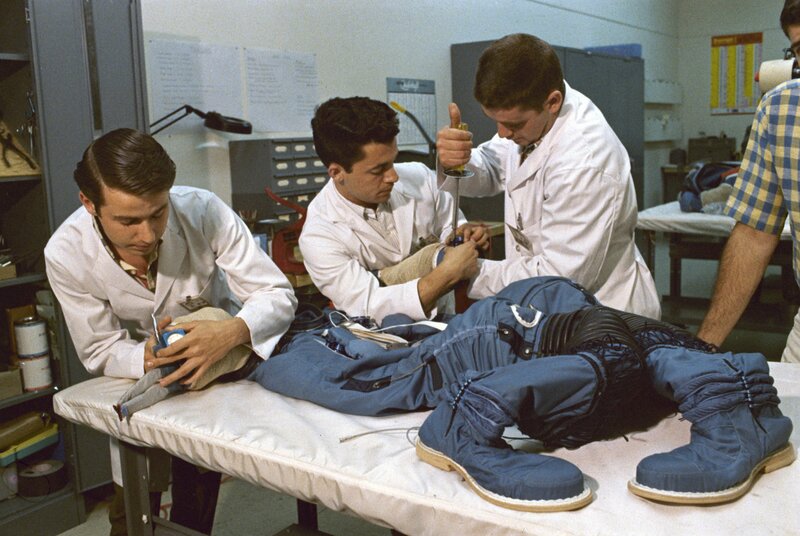 Despite its rugged good looks, though, the hard suit was ultimately deemed unsafe—one puncture, by a moon rock or a misused tool, meant disaster. “When a hard shell fails, it fails spectacularly,” says Nicholas de Monchaux, a professor of architecture and urban design at the University of California, Berkeley, and author of the book Spacesuit: Fashioning Apollo . Softness—and layering, which equals safety via redundancy—means the person inside the suit is less vulnerable than beneath a hard carapace. It was Playtex’s soft suit design—so different from the armor-like hard suits—that went to the moon. From its multi-decade history of building foundation garments for women, the company had plenty of experience in dealing with pressure, movement and the vagaries of the human body. “[T]he expertise that made such a puncture-resistant, complex latex assembly possible was the same flexible know-how that produced the world’s best-selling girdle,” de Monchaux writes. The Apollo suit’s ingenious hand-sewn layers of latex, neoprene and knitted nylons meant that the suit was, in the field, harder to breach than the hard suit—and indeed it kept our astronauts safe enough to plant that famous flag. “On July 21, 1969, only 21 layers of fabric, most gossamer-thin, stood between the skin of Neil Armstrong and Buzz Aldrin and the lethal desolation of a lunar vacuum,” de Monchaux writes. The suits astronauts will be wearing on Mars ( by 2024, Elon Musk says ) will be soft too—though there’s plenty of debate about what kind of soft. Should we stick with the gas-pressurized suit or go in a new direction altogether? Even greater movement—and durability—will matter tremendously when our fellow humans are on a six- to eight-month trip away from Earth. And they will be working—constructing domes, exploring the planet, gathering samples and doing science. For that, they need suits that are more durable and flexible than any previous model. The good news is that Mars is less hostile to human life than the moon or outer space—the red planet has some gravity (38 percent of that on Earth), and temperature fluctuations are a bit more moderate. D esigning a suit for Mars instead of outer space “radically simplifies the problem,” says de Monchaux. But the red planet brings other challenges, like the swirling winds of fine dust that will work its way into the cracks and crevices of habitats, rovers and, of course, Mars suits. Then there’s walking. Since you don't amble about in space, leg movement isn't much of a priority for suits used at the International Space Station, which is where most recent suit advances have been made. Once locomotion across a planet's surface is required, reducing weight in the lower half of the suit matters, as does knee and ankle flexibility, and ensuring the feet are able to feel the surface they are walking on, to prevent tripping and injury. Wear and tear, from both the harsh Mars surface outside and human movement inside the suits (from all that work), have to be considered. Speaking of interiors—they’re going to get gross, since early explorers will be wearing them for many hours at a time, day after day, week after week. “ They need to be cleanable, to come off and be replaced,” says Gifford. All of this means that Mars suits must be durable but also need to have replaceable, repairable parts that can be hosed off . This, says Gifford, calls for a modular design. The new Mars suit from a team at the Rhode Island School of Design has detachable, removable parts. It takes inspiration from what Gifford gleaned from her time at HI-SEAS, the Mars simulation, and the suit she tested there. 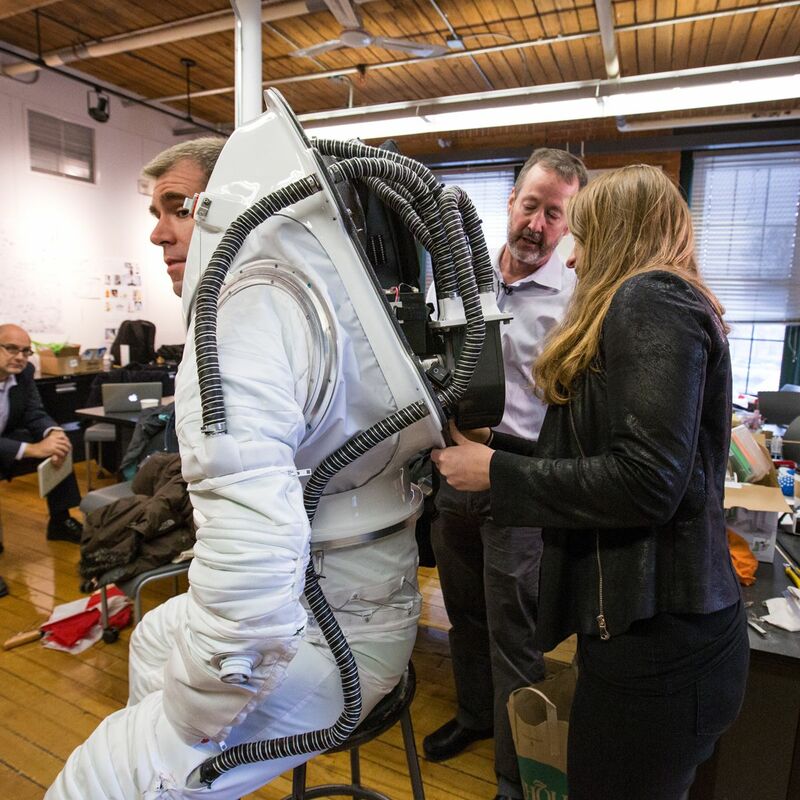 Led by professor Michael Lye, RISD’s longtime NASA coordinator, students Erica Kim and Kasia Matlak created the suit, which can fit a wider variety of body shapes and sizes—from 5 feet 2 inches to 6 feet 3 inches—due to its modularity. Shoulders can be widened or narrowed, legs can be lengthened, and the waist can be strapped in. This means suits would be interchangeable for the astronauts on Mars—anyone can grab a suit off its peg and go outside. When astronauts come back into their Mars habitat after a day of work, broken or worn parts can be swapped out of the suit, and it can be cleaned. The RISD team’s aim was to bring real-world human needs to the design process, so not only does their suit fit more people, but it can also be adjusted to the type of work they’re doing or what they might be carrying. It’s easier to get in and out of, and it should be more comfortable to move in. Their suit is headed to the Mojave Desert in June for its first stress test. Some modifications might be made, then it will be more fully tested in the next HI-SEAS mission, in 2018. While gas-pressurized suits are a known quantity, critics say they still lack the flexibility that humans will need to build a new human base on Mars. The Massachusetts Institute of Technology’s BioSuit and other so-called “skin suit” designs solve the pressurization problem the old-fashioned way, with a supertight wrapping. (Remember those Japanese kamikaze pilots from the ’40s? Same basic technology.) Here, mechanical counterpressure does the same job the gas-pressurized suits do, with much less suit volume. The head still needs a helmet, to which a breathing apparatus can be attached, but the rest of the body is far more free and mobile in what is basically a giant body bandage. To wear such a suit, though, you need to be able to get into it. The first version of a skin suit required 45 minutes and three people to pull it on, an inch at a time. That’s how tight it needs to be. The solution is a suit that loosens when it’s not being worn, then shrinks to the wearer’s body. To solve this problem, Brad Holschuh, who was a postdoctoral researcher at MIT and is now an assistant professor at the University of Minnesota and co-director of the school’s Wearable Technology Lab, developed special coils made from a shape-memory alloy. This material can pop back to a previously engineered shape when heated by applying a current. When cool, the fabric that the coils live within is loose, and when a switch is hit, it springs back into shape, tight enough to provide the pressure needed to “shrink-wrap” a body. “Skin suits provide better protection in the event of a failure,” says Holschuh, pointing out that there are lots of materials that are robust even if they tear, like rip-stop fabrics, so a suit breach might mean localized skin discomfort but not a life-threatening depressurization. When it comes to repair, Guillermo Trotti, co-designer of the MIT BioSuit (along with Dava Newman), says, “Maintenance is going to be critical. You’ll need to make or change parts or 3-D-print parts.” In this suit too, modularity is key: If pieces can be fixed or replaced, that makes being far away from Earth a less fraught issue—and the smaller size and lighter weight of a skin suit mean it would be easier to bring replacement materials along.